We haven't had a post in a while and it's not because we aren't cooking, in fact since we've had our baby, we've been cooking at home more than ever. But baking, my favorite part of cooking, has been on the backburner. And blogging, well, it's been a busy month but we're hoping to use holiday cooking as a reason to get back on the blog! With a full time job, a long commute, and a little one in the mix, my evenings are now full of family time and work catch-up. But I think I've come up with a way to get a little bit of baking back into the mix- ok, it's actually starting with a mix. I've never been one for mixes but at this point, a good quality baking mix is a great shortcut. And it's either a shortcut or no baking. 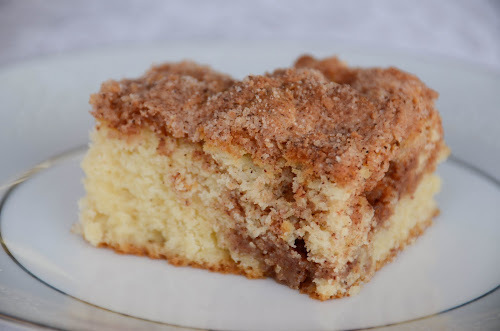 This shortcut is especially helpful at 6AM on a Saturday or Sunday morning, which is when I made this cinnamon crumb coffee cake- a mix from Trader Joe's. My little peanut doesn't have a snooze button and he's up at 6AM. I've figured out that I have a little window of time in the morning with him in the pack and play to whip out a simple recipe or baking mix. What I really liked about this mix was the flexibility in the recipe to add butter or oil ( butter, of course), and to put the crumb in between the batter or only on top. I actually put it on top and drew a knife through it to add some swirl. I also went for whole milk- why not? The result was quite delicious and filled the house with the smell of coffee cake first thing in the morning. The cake was actually best when it had cooled and the sugar in the crumb had recrystallized for a crunchy texture in the swirl. 5) I'm also considering making my own mixes the night before or in advance. Do you have a favorite mix I should try? Or a simple one bowl - one pan recipe? I'd love to try it! I will have to think about an appropriate recipe, but I do have a question about advanced preparation of ingredients for a quick mix in the morning. Many baking recipes require adding the dry ingredients to the wet in scoops over time. Box recipes usually allow you to add the wet into the dry all at once and just mix it all up. Why the difference? That could be a key point in turning a recipe into an easy to make morning treat.